Jorge López Moreno was born in Madrid, where he graduated with a Bachelor of Science in Industrial Engineering from Universidad Pontificia de Comillas de Madrid, ICAI. Then moved to Switzerland to pursue a Master of Science in Mechanical Engineering and graduated in 2011 at the Swiss Federal Institute of Technology in Lausanne (EPFL). His research in the field of renewable energy was awarded with the Zanelli Prize in Switzerland in 2011 and he was offered to work some months after graduation at a Federal Energy Laboratory attached to EPFL. After working at this Federal Laboratory, he started to work for Nestlé, where he stayed for two and a half years, first as an engineer, providing technical assistance to R&D projects and factories worldwide, and then as a capital investment project manager. 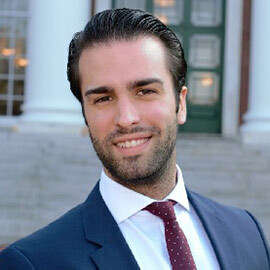 He started the MBA program at Harvard Business School in the Fall of 2014 and has been working during the summer of 2015 as an MBA Summer Associate at H.I.G Capital, a private equity firm, at their Madrid office. He has also been a member of the Board of Engineers without Borders in Switzerland and Speaker for the Desertec Foundation.